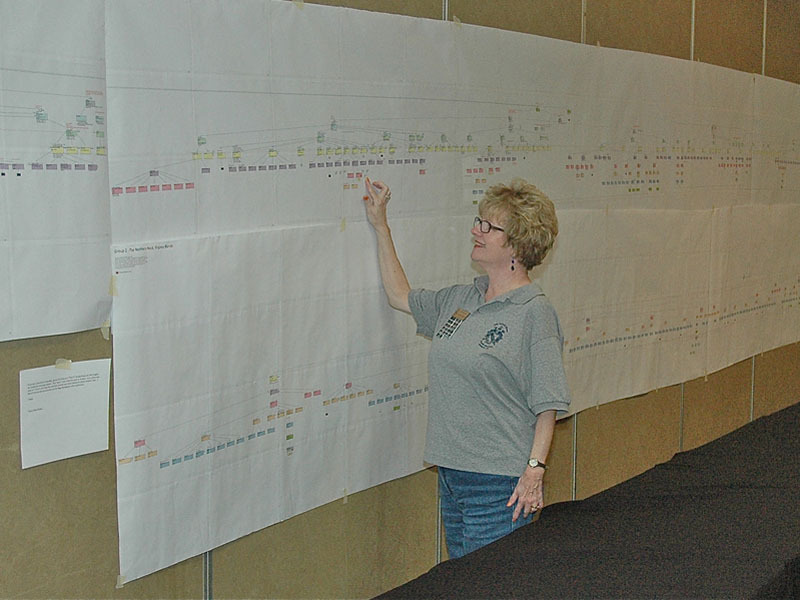 Terese Bland Bueker points to her Edgefield Co., SC ancestor, Talton Bland, on the 150′ family tree which made it’s debut at the last National Bland Family Reunion. “The one person I want to meet in Heaven, besides my mother, of course, is Talton Bland,” said Terese Bland Bueker of The Woodlands, Texas. “And the first thing I’m going to say to him is ‘Talton, who’s your Daddy? !’” As a genealogist I learned that my ancestor, Talton Bland, was born in Edgefield Co., SC in 1800, but I couldn’t get beyond that. I didn’t even know which of the many Blands in the county his father was. I finally gave up in frustration. That all changed in 2002 when I attended my first national Bland Family Reunion which was held in my hometown of The Woodlands, TX. The guest speaker was the president of Family Tree DNA, the most prominent testing lab to offer this new technology to genealogists world wide. I was inspired to start the Bland Family DNA Project and became the coordinator. Our first two volunteers were my brother and a second cousin. (I could not be tested because only males with the last name of Bland were qualified. Only men have Y-DNA.) Testing was easy – a test kit was mailed to the volunteers who used a toothbrush-like implement to swab their cheeks. There was a cost involved ($154), but I paid for my brother’s test. That was 10 years ago and we now have 95 participants in the Project. The national Bland Family Reunions were started soon after the publication in 1982 of A Vision of Unity: The Bland Family in England and America 1555-1900 by Charles L. Bland (another Edgefield Co. descendant). It was Charles’ hope that genealogical research would establish that all American Blands would prove to be related, at least back in England. Unfortunately the DNA project has ended Charles’ “vision.” (We now have 24 separate, unrelated lines.) But he is excited by the results and what we’re learning about the different lines. It is probable that all the Blands in Edgefield Co., SC come from the same ancestor, James “The Immigrant” Bland (1661 – 1709), who was born in England and was in VA by 1687. Three generations later, Robert Bland (ca 1732-1787) migrated from Louden Co., VA to Edgefield Co., SC between 1778 and 1782. DNA testing proved that I was descended from this Robert. It has not yet revealed which of Robert’s sons was Talton’s father, but I’m hopeful that more Bland descendants from Edgefield County will be tested and that one will point to the right culprit. One Edgefield County DNA Participant in 2008 did provide a clue. His results identified a mutation at Marker #35 (CDY-b), which I call the “Edgefield Co., SC Mutation.” Most Northern VA Blands have a 38 at that marker. So far all 7 Edgefield Co., SC descendants have a 37. Next month I will be attending the 28th Annual Bland Reunion. I would like to invite Bland descendants in Edgefield County to join us in Sumter, SC at the Quality Inn on Broad St. September 21-23, 2012. The focus this year is on the Bland Families of South Carolina, North Carolina & Georgia. Activities at the reunion will include a tour of Swan Lake Iris Garden, a vast preserve that has most of the species of swans in the world, founded by Hamilton Carr Bland, a descendant of the Northern VA Blands. It will also feature three seminars, including “How to Research Your Genealogy,” “The DNA Project,” and “The Story of Mariah Bland.” The Bland Heritage Reunion welcomes ALL Blands (Blan, Blann, etc.) and their allied families. To register, go to the Bland Heritage Foundation website: www.blandheritage.org. Registration should be received by August 22. However, drop-ins would be welcome to all activities (except the banquet) with registration at Sumter at the time of the Reunion. If you can’t make it to the Reunion, you can still join the Bland DNA Project by contacting me at: teresebueker@comcast.net. There is a possibility that some financial help might be available to those who would like to be tested. I will also be hanging out at the Tompkins Memorial Library in Edgefield, SC on September 24 and 25. I can try to answer your questions about the DNA Project, and I can sign you up in person! “I admit that I’m excited at the possibility of meeting more of my Edgefield County ‘cousins’ and coming to Edgefield,” said Bueker. “I’m looking forward to doing a little research at the genealogical library and most important of all – walking in the footsteps of Old Talton Bland.